So, did The Darkness always have this aspect of God in it? 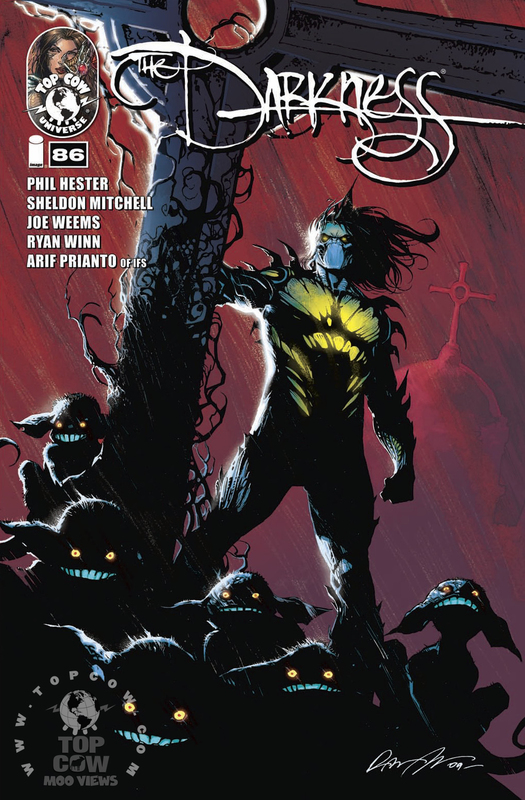 The Darkness #86 is the second part of Alkonost storyline. Jackie is captured by an individual who wants to collect him. We learn out why, which I didn’t see coming and also why Jackie is seeing visions of his sister. Alkonost, Part 2 of 2! In the hunt for The Sovereign Jackie and crew strike a deal with an insane Russian mobster and collector of the occult, but his supernatural enforcer wants to add a Darkness wielder to the collection. What is The Alkonost and how does it control even The Darkness itself? Top Cow Pit artist Sheldon Mitchell (Pilot Season: Stealth) joins regular writer Phil Hester (Gen13, The Anchor) for a sinister two-part story. Featuring a cover by Rafael Albuquerque (American Vampire)! The story is interesting and definitely kept me on my toes. My biggest issue is I felt like things needed to be expanded more, and this story might of been helped by expanding it to a third issue. There’s a lot going on, including a new factor in the Darkness world (at least I think it’s new, I’m new to the series, give me a break). There’s a strange mix of religion with the Darkness and one I’m not positive fits perfectly. Also, once we learn what’s really been collected, it seems to be too powerful of an object to just be hidden away. I’ve generally enjoyed the Darkness but this issue while entertaining came off as rushed and not completely fleshed out as much as it should have been.